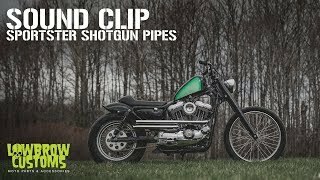 Whether giving you added ground clearance on a scrambler or tracker, or just for high-and-tight style on a rigid or swingarm Sportster, the Shotgun Exhaust Pipes from Lowbrow Customs make quick work of improving your motorcycle's look and sound. Quick and E-Z bolt-on install with the included heavy-duty mounting brackets and hardware. Available in your choice of chrome or high-temp black. Other things you might find useful are several colors of exhaust header wrap, and you can also check out our selection of finned, smooth and fish scale cast aluminum motorcycle exhaust heat shields. These will keep you and your passenger from accidentally burning your leg while riding, plus there is the added benefit of their cool style. • Note: As with any new exhaust, you may need to change carburetor jetting or use of an aftermarket fuel injection control module for peak performance. • Note: For 1986-1989 models you would need to modify the exhaust bracket to work with the stock chain drive and change the starter motor to a later, smaller size starter than the stock Hitachi starter. • There is no warranty on exhaust pipes and mufflers with regard to any discoloration. Blueing is caused by tuning characteristics, cam timing, carburetor jetting, overheating, etc. and is not caused by defective manufacturing. No refunds on exhaust pipes once motorcycle is started unless there’s a manufacturer’s defect. The frame mounted bracket keeps the pipes very secure. Used 1/4 inch eye bolts and washers to tune for back pressure. Using forward controls so hot pipe is not by my leg. For the price point I dont think you can get better exhaust. The pipes are great quality, bends are nice and uniform, and packaging is great. That being said, check where your rear motor mounts are in relation to your chain/belt. The mount to support this exhaust requires use of the two rear motor/transmission mounts. On my particular tracker build my chain is in the exact place I need the mount for the exhaust to run. The intention is to have the chain go above tbe mount but on my build and maybe on yours it will have to be clearanced to be able to even fit. Solid product, it is exactly as advertised, easy to install and arrived in two days. I bought a pair of shotgun pipes to finish the scrambler conversion of a 1989 xl 883. I had previously installed Burly (Progressive) Stiletto 15 in, shocks for more rear clearance and travel along with an 18 in. spoked wheel. The new shocks and wheel change the suspension geometry and with it, the space between the chain and swingarm is greatly reduced. Here is the problem -- the rear bracket that comes with the shotgun pipes attaches to the rear engine mounts. With the new suspension geometry, the chain would rub on the exhaust bracket if I were to fit it. I'll have to figure out plan B. 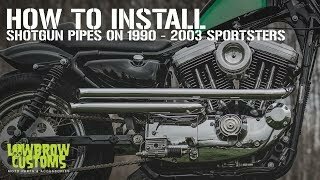 With the shotgun pipes, you also have to modify the 1989 Sportster chain guard, but that was clear in the description of the pipes on the Lowbrow site. I would suggest that Lowbrow make it clear that the exhaust bracket may not fit if you have altered your rear suspension to give it more travel -- as most scrambler converters would have. What is the pipe inner and outer diameter? The OD is 1.7650" and the ID is 1.6125"
Why won’t these fit and big twin evo ridged ?